Unhandled exception in main thread. Would be nicer to debug the app and make it break and indicate the position that raised the exception. 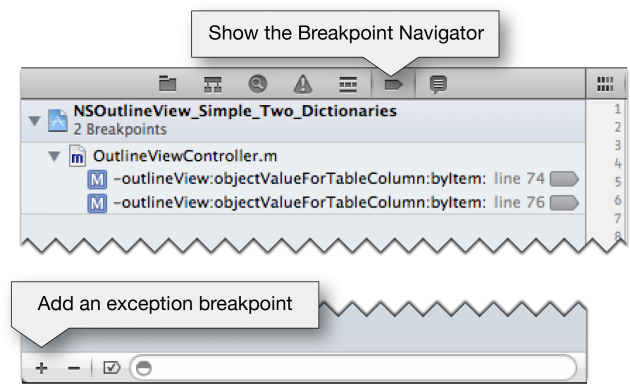 Comes in light XCode 4 exception breakpoints. This will bring up two options. Exception and Symbolic Breakpoint. I will cover creation and usage of symbolic breakpoints in another post because there is a much more elaborated discussion. Exception breakpoint options popup. Leave all at default values; we’ll discuss these in another post. Execution breaks on the line that raised the exception, and the corresponding line is marked. Console log with exception breakpoint. I am using this for all my projects. First thing, after project setup, I add an exception breakpoint. That is very handy and saves a lot of debugging time. Hope you will find it useful. Filed in Code Snippets & Hints, Most commented and tagged breakpoints, Cocoa, exception handling, Objective-C, programming, XCode 4. Bookmark the permalink.